Update: Oracle is always changing, and for the latest consensus on using multiple blocksizes in Oracle, see the latest research on multiple blocksizes. The introduction of Oracle 9i brought an amazing amount of complexity to the Oracle database engine. Oracle introduced many new internal features, including bitmap free lists, redo log based replication, dynamic SGA, and perhaps the most important feature of all, the ability to support multiple block sizes. WARNING: Using multiple blocksizes effectively is not simple. It requires expert-level Oracle skills and an intimate knowledge of your I/O landscape. While deploying multiple blocksizes can greatly reduce I/O and improve response time, it can also wreak havoc in the hands of inexperienced DBA's. Using non-standard blocksizes is not recommended for beginners. ?With segments that have atypical access patterns, store blocks from those segments in two different buffer pools: the KEEP pool and the RECYCLE pool. A segment's access pattern may be atypical if it is constantly accessed (that is, hot) or infrequently accessed (for example, a large segment accessed by a batch job only once a day). Multiple buffer pools let you address these differences. You can use a KEEP buffer pool to maintain frequently accessed segments in the buffer cache, and a RECYCLE buffer pool to prevent objects from consuming unnecessary space in the cache. . .
Isolate or limit an object to a separate cache"
Contention reduction - small rows in a large block perform worse under heavy DML than large rows in a small blocksize. Faster updates - Heavy insert/update tables can see faster performance when segregated into another blocksize which is mapped to a small data buffer cache. Smaller data buffer caches often see faster throughput performance. Reduced Pinging - RAC can perform far faster with smaller blocksizes, reducing cache fusion overhead. Less RAM waste - Moving random access small row tables to a smaller blocksize (with a corresponding small blocksize buffer) will reduce buffer waste and improve the chance that other data blocks will remain in the cache. For a complete treatment of using multiple blocksize to improve I/O performance and manageability, see my book "Oracle Tuning: The Definitive Reference". When you strip away all of the advanced features, Oracle's job is to deliver data, and the management of disk I/O is a very critical component and tuning of any Oracle database. 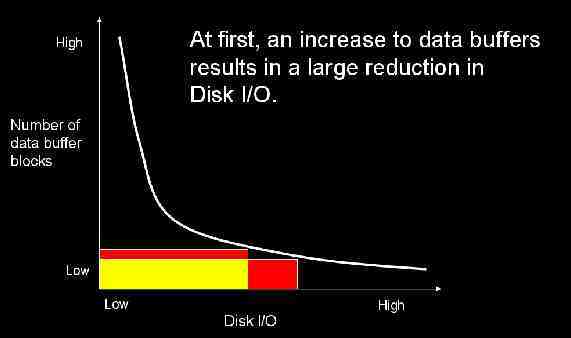 Anything that can be done to reduce the amount of disk I/O is going to have a positive impact on the throughput of the Oracle database system. If we take a look at the various tuning activities within Oracle database, will see that the common goal of almost Oracle tuning is the directed and immediate goal of reducing disk I/O. For example, tuning an SQL statement to remove a full table scans makes the query run faster because of the direct reduction in the amount of data blocks that are read from the disk. Adjusting instance tuning parameters such as DB_CACHE_SIZE also has the goal of reducing the amount of disk overhead. To understand how using multiple block sizes can improve performance of the Oracle database, we first have to start by taking a look at the basic nature of disk I/O. Anytime an Oracle data block is accessed from disk, we commonly see three sources of delay. The first and most important source of delay is the read-write head movement time. This is the time required for the read-write head to position itself under the appropriate cylinder. We also see rotational delay as the read-write head waits for the desired block the past beneath it. The third source of delay is the data transmission time from the disk back to the Oracle SGA. If we accept the premise that 99 percent of the latency is incurred prior to actually accessing the desired data block, then it makes sense that the marginal cost for reading a 32K block is not significantly greater than the cost of reading a 2K block. 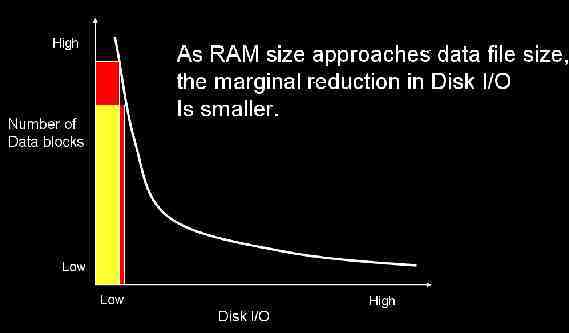 In other words, the amount of disk delay is approximately the same regardless of the size of the block. Therefore it should follow that the larger the block you can read in on a single I/O, the less overall I/O will be performed on the Oracle database. The principle behind caching is not unique to Oracle databases. Access for RAM is measured in nanoseconds, while access from disk is generally measured in milliseconds. This amounts to a to an order of magnitude improvement in performance if we can get the Oracle data block into a RAM buffer. As Oracle grows more sophisticated and RAM becomes cheaper, we tend to see Oracle databases with system global areas (SGA) that commonly exceed 10 GB. This has important ramifications for the performance of the Oracle database because once read, the Oracle data blocks reside in RAM where they can be accessed tens of thousands of times faster than having to go to disk in order to retrieve the data block. RAM buffers and Oracle data access Oracle has always provided RAM data buffers to hold incoming data blocks, and data can be read from the buffers 14,000 times faster than reading the data block from disk. The RAM data buffer has evolved from a single buffer in Oracle7 to three data buffers in Oracle8i. These were known as the KEEP pool, the RECYCLE pool, and the DEFAULT pool (refer to figure 1). In Oracle we still have the three data buffers, but we also have the ability to create a data buffer for every supported blocksize for the Oracle server (refer to figure 2). Within each data buffer, the data buffer hit ratio measures the propensity of a data block to be in RAM memory. It is the job of the Oracle administrator to allocate RAM pages among the data buffers to ensure the optimal amount of RAM caching. With small buffers, a marginal increase of pages results in superior caching (refer to figure 3). As the RAM cache is increased, the marginal benefit from adding pages decreases (refer to figure 4). Prior to Oracle, Oracle professionals noticed that by moving the entire database to a larger block size, they reduce disk I/O improve the performance of the entire system. This is somewhat counterintuitive, and people ask "if I only need an 80-byte row, where do I get the benefit of reading 16K block?" The answer has to do with indexes. Most well-tuned Oracle database have index based roughly equal to the space of the table data. There's no question of a large block size for indexes is going to reduce I/O, and therefore improve the overall performance of the entire database. For example, insert-intensive databases will perform less write I/O (via the DBWR process) with larger block sizes. This is because more "logical inserts" can take place within the data buffer before the block becomes full and requires writing it back to disk. Some shops define their high-insert tablespaces in a larger blocksize to minimize I/O, and some use SSD to achieve insert speeds of over 10,000 rows per second. For a more complete discussion, see my Oracle Multiple blocksize tips. For these very large, high activity databases, some DBA's will choose to create a 32K tablespace, a corresponding 32K data buffer, and then migrate all of the indexes (but only those that experience multiblock reads) from their existing blocks into the 32K tablespace. Upon having done this, the Oracle database can read a significant amount of index note branches in a single disk I/O, thereby reducing stress on the system and improving overall performance. So given that we have the ability to create multiple data buffers within the Oracle database, how do we decide what data that we want to put each of these data buffers? Let's start with some of the more common techniques. Segregate large-table full-table scans - Tables that experience large-table full-table scans will benefit from the largest supported block size and should be placed in a tablespace with your largest block size, setting db_file_multiblock_read_count according to this blocksize. Set db_recycle_cache_size carefully - If you are not setting db_cache_size to the largest supported block size for your server, you should not use the db_recycle_cache_size parameter. Instead, you will want to create a db_32k_cache_size (or whatever your max is), and assign all tables that experience frequent large-table full-table scans to the largest buffer cache in your database. The Data Dictionary uses the default cache - You should ensure that the data dictionary (e.g. your SYSTEM tablespace) is always fully cached in a data buffer pool. Remember, the block size of the data dictionary is not as important as ensuring that the data buffer associated with the SYSTEM tablespace has enough RAM to fully-cache all data dictionary blocks. Segregate Indexes - in many cases, Oracle SQL statements will retrieve index information via an index range scan, scanning the b-tree or bitmap index for ranges of values that match the SQL search criteria. Hence, it is beneficial to have as much of an index residing in RAM as possible. Segregate random access reads - For those databases that fetch small rows randomly from the disk, the Oracle DBA can segregate these types of tables into 2K Tablespaces. We have to remember that while disk is becoming cheaper every day, we still don't want to waste any available RAM by reading in more information to RAM than the number actually going be used by the query. Hence, many Oracle DBAs will use small block size is in cases of tiny, random access record retrieval. Segregate LOB column tables - For those Oracle tables that contain raw, long raw, or in-line LOBs, moving the table rows to large block size will have an extremely beneficial effect on disk I/O. Experienced DBAs will check dba_tables.avg_row_len to make sure that the blocksize is larger than the average size. Row chaining will be reduced while at the same time the entire LOB can be read within a single disk I/O, thereby avoiding the additional overhead of having Oracle to go out of read multiple blocks. Check the average row length - The block size for a tables' tablespace should always be greater than the average row length for the table (dba_tables.avg_row_len). Not it is smaller than the average row length, rows chaining occurs and excessive disk I/O is incurred. The process of segregating Oracle objects into separate data buffers is fairly straightforward and Oracle provides tools to assist in this effort. Many Oracle administrators are not aware of those table blocks, which consume a disproportional amount of data space within the data buffer caches, and Oracle provides numerous scripts to allow you to see which objects reside most frequently within the data cache. The query below counts the number of blocks for all segments that reside in the buffer cache at that point in time. Depending on your buffer cache size, this could require a lot of sort space. Here we see the object name and the number of data blocks in the buffer. The process of assigning table or index blocks into named block size tablespaces is very straightforward within Oracle. The first step is to set a database cache to correspond to that block size. Remember, with Oracle 9i we no longer have to use the init.ora file, and we can create the named cache dynamically with an alter database statement. We begin by creating a tablespace and using the new blocksize parameter in the create tablespace syntax. In the example below we create a 32K tablespace within the Oracle database. Once we've created the named RAM buffer, and the tablespace, we are now ready to migrate the Oracle objects into the new tablespace. There a variety of methods for moving objects from one tablespace to another, and many Oracle administrators are already familiar with using the create table as select or CTAS syntax in order to move the table. For indexes, the alter index rebuild command can be used to quickly migrate an index tree between tablespaces. Out of all of the sophisticated enhancements of Oracle, many experienced DBAs consider multiple block sizes to be the most important feature for tuning the Oracle database. The Oracle database administrator now has up to seven separate and distinct data pools that they can manage and control, giving the Oracle DBA a huge amount of control over the amount of data buffer blocks that can be assigned to specific database objects. Through judicious inspection all of buffer access characteristics, overall disk I/O can be tremendously reduced, and the performance of the database will be greatly improved.